Whew. Blogging during the holidays is tough stuff! I got a few posts out there, but that was really all I could muster with all the chaos happening around us. That being said, I thought I’d start the New Years with one of my favorite recipes. This one is really a source of pride for me, and since we usually have an abundance of lean beef in the freezer, I’ve had plenty of practice and time to perfect it. Hormone-free, almost entirely grass fed, lean beef…there are some great perks to marrying into a family of farmers. If you ever have a chance to buy a side of beef off a local farmer, I’d recommend it. We do end up with a lot of ground beef, so I’m always looking for new ways to prepare it. 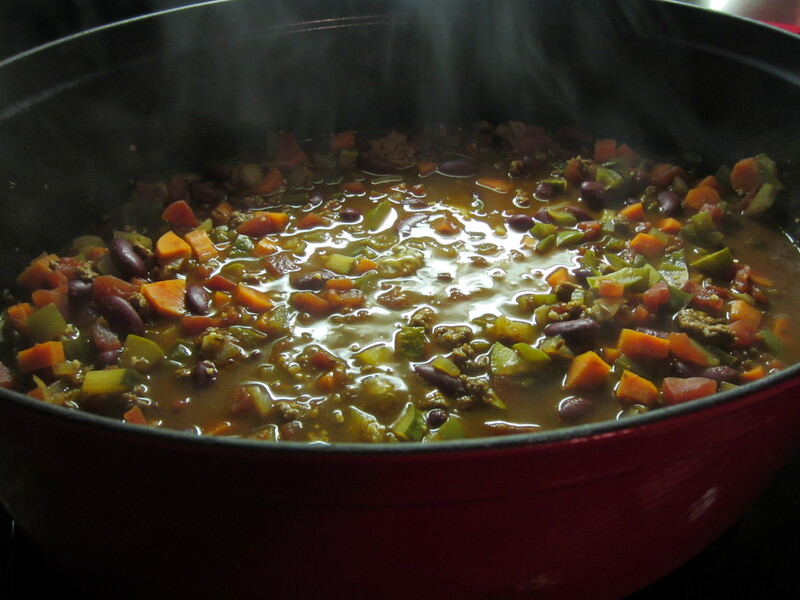 This, however, is my go-to recipe, and even though it’s relatively time-consuming to slice up all the vegetables, the flavor of this healthy chili is surprisingly awesome. And I’m not just saying that. The carrots and zucchini really soak in all of the seasonings, so they don’t taste like…well, vegetables. It is a little spicy, but it’s not too bad. If you wanted to make it a bit milder, I’d recommend using diced tomatoes without chipotle (though that will take away a bit of the smoky taste). The poblano pepper adds to the heat too, but I really feel the poblano flavor differentiates this chili from others. So dish up a nice, large bowl of chili (’cause you can). I know you’ll enjoy it. Heat a large pot or dutch oven over medium-high heat and coat with cooking spray. When hot, break up the beef until crumbly, then add the poblano pepper, bell pepper, garlic, onion, salt, and pepper to the pot. Brown the beef, stirring occasionally. 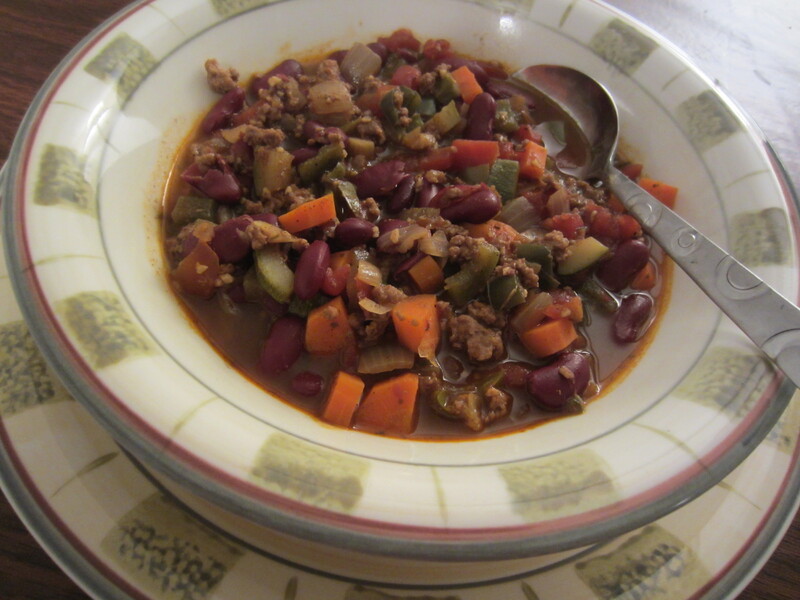 Mix in the cumin and chili powder, then add the zucchini, carrots, kidney beans, beef broth, and diced tomatoes. Bring to a boil, stirring occasionally, then cover, reducing the heat, and simmer for 45 minutes. Jenny Craig: Perfect for either lunch or dinner. Weight Watchers: 7 Points (using calculatorcat.com).